Pattern recognition receptors (PRRs) activate immunity upon pathogen invasion and are crucial for the survival of land plants. It is well known about how PRRs recognize microbial patterns. However, how PRRs activate immune responses remain poorly understood. One of the most important immune signaling events is the activation of the mitogen-activated protein kinases MPK3, MPK4 and MPK6 (MPK3/4/6), which are the most important node in plant immunity. Despite extensive studies in more than 16 years, but the MAP kinase kinase kinase (MAPKKKs) governing MPK3/6 activation downstream of diverse PRRs and the underlying mechanisms by which different PRRs activate MAPK cascades remain elusive. A Team led by ZHOU Jian-Min at Institute of Genetics and Development Biology of Chinese Academy of Sciences uncovered a long-sought-after missing link between a receptor kinase and MAPK cascades. 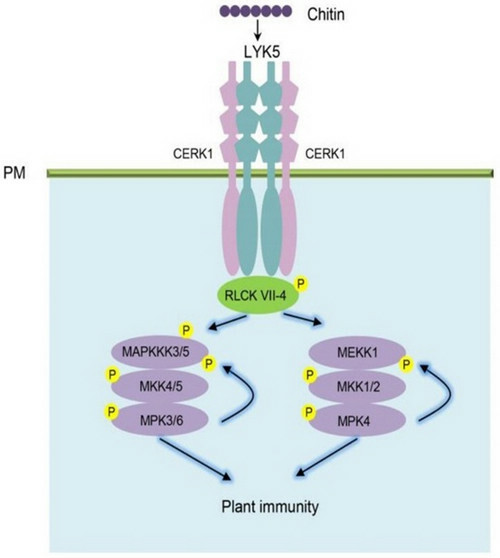 They not only found that RLCK VII members and MAPKKK3/5 act downstream of PRRs to control MPK3/6 activation, but also identified key mechanisms in MPK activation, namely phosphorylation at specific sites in MAPKKK5 and MEKK1 for RLCK-dependent activation and MPK-dependent feed-back regulation. Unlike previous report which suggested a mechanism that only operates in the chitin signaling pathway, the work illustrated how common components and biochemical mechanisms are deployed downstream of multiple PRRs. This work will have broad impact to the field of plant immunity and receptor kinase signaling in plants. The findings are published online in Plant Cell entitled “Receptor-like Cytoplasmic Kinases Directly Link Diverse Pattern Recognition Receptors to the Activation of Mitogen-activated Protein Kinase Cascades in Arabidopsis” on June 05, 2018 (https://doi.org/10.1105/tpc.17.00981). The work was supported by the Strategic Priority Research Program of the Chinese Academy of Sciences and Chinese Ministry of Science and Technology.